The Genealogy Special Interest Group (GENSIG) will meet on Saturday, May 10 at 10 am at the Goshen Public Library (601 S. 5th St., Goshen IN 46526). For more information, please contact Young Snodgrass - young.snodgrass@frontier.com. Family Search has updated the Indiana marriage index 1811-1959 that is in progress. Digital images of marriage records have been added for Miami County (1845-1957) and Wells County (1863-1951). These images are browseable and have not been indexed yet; the database is searchable for 67 of Indiana's 92 counties. Visit our Indiana Marriage Indexing Project page for more information and a breakdown of what counties are included. The Bittersweet Library in Mishawaka (602 Bittersweet Rd., Mishawaka IN) will host a Q&A with conservator Liz Dube on Saturday, May 3 from 1 to 2 pm in honor of Preservation Week. Bring your family treasures and your questions about how to preserve and care for them. The Elkhart County Genealogical Society will host a program by Jeannie Regan-Dinius, Director of Special Initiatives for the Indiana Department of Natural Resources' Division of Historic Preservation and Archaeology, on Thursday, May 15 at 7 pm. The program will be held at the First Presbyterian Church in Elkhart (200 East Beardsley, Elkhart IN). Regan-Dinius will share information on the care and restoration of cemeteries, including the proper procedures to clean tombstones without doing permanent damage. You all are so wonderful!! Also, need to thank Wayne County, IN, for all their help too! Harry was one of nine children (that I know of). His brother Elam is my great grandfather (Elam’s death cert had his parents unknown). Elam moved to Philadelphia to work for the PRR and married Lydia Boehm. So my missing siblings are Catherine, ca 1833, William, ca 1835, Sarah, ca 1836, James, ca 1837, Sallie, ca 1842, Lydia, ca 1843 (married Whitman), Letitia, ca 1845, John, ca 1852. Their brother Matthew stayed in Lancaster, PA and passed 1901. They were all born in Lancaster, PA.
It’s difficult with the surname Jones! If anyone could help or guide me to where I might find marriage records, etc. for the above siblings would be wonderful. The Indiana Genealogical Society now has 1,272 databases in the Members Only area. Each of Indiana's 92 counties has at least 5 databases. Shelley Cardiel (cardiels@comcast.net) has found 3 photos belonging to the STRYCKER family of northern Indiana and Missouri. The first photo (shown at left) is identified as Jesse STRYCKER and was taken at the Iden Studio in Bourbon, Marshall County, Indiana. This photo appears to have been taken in the 1880's or 1890's, with Jesse likely in his 20's at the time. The second photograph is also identified as Jesse STRYCKER taken at the age of 5 years, likely in the early 1900's - perhaps the man in the first photo is the father of the Jesse in the second photo. Christian Jesse STRYCKER was born 5 February 1873 in Elkhart, Indiana to parents William Henry Harrison STRYCKER (born 1836 or 1837 in Canada; died 1900 or 1901) and Nancy STOUDER or STROUDER (born 1841 in Elkhart, Indiana; died 1915). 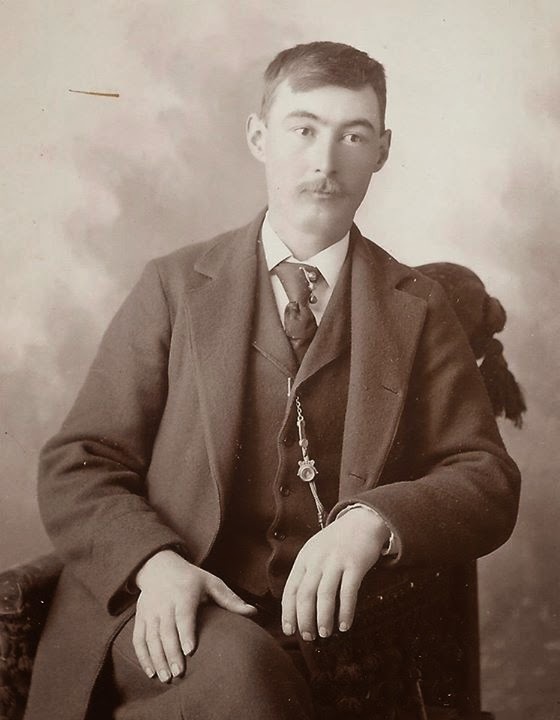 Jesse was one of 10 children born to this couple including: Jacob H.; Amanda; William S.; Angelina; George; Jesse; Lavina Jane; Louvina; Katie Ann; and Nancy STRYCKER, all born between 1858 and 1880. Jesse’s first marriage was to Zephina E. HOFF (1876-1909) with whom he had three children including, Ethel O.; Jesse S.; and Glen W. STRYCKER all born between 1894 and 1901. Jesse’s second marriage was to Anna E. CONRAD (born 5 May 1871) on 27 March 1930. Information on the FindAGrave website suggests that Jesse died 10 August 1896 in Mayville, North Dakota and is buried in the Mayville Cemetery there, though that doesn’t match with the birth of children or marriage records? Son Jesse S. STRYCKER was born 30 July 1898 in Elkhart and was living at No. 2 New Paris, Elkhart when he registered for the World War I draft in 1917 or 1918. His father Christian signed as the closest relative and Jesse listed his occupation as farm laborer at the time. Mildred STRYCKER was born March 1899 in Kansas to parents Irvin STRYCKER (born 1876) and Kate E. STRYCKER (born 1876). Mildred married Milford Louis SAMPSON (1899-1922). Shelley is hoping to locate someone from this Strycker family so that the photo can be returned to the care of family. If you are a descendant of this family, or you know someone who might be, please contact her directly. The Indiana Genealogical Society now has 1,270 databases in the Members Only area. Each of Indiana's 92 counties has at least 5 databases. 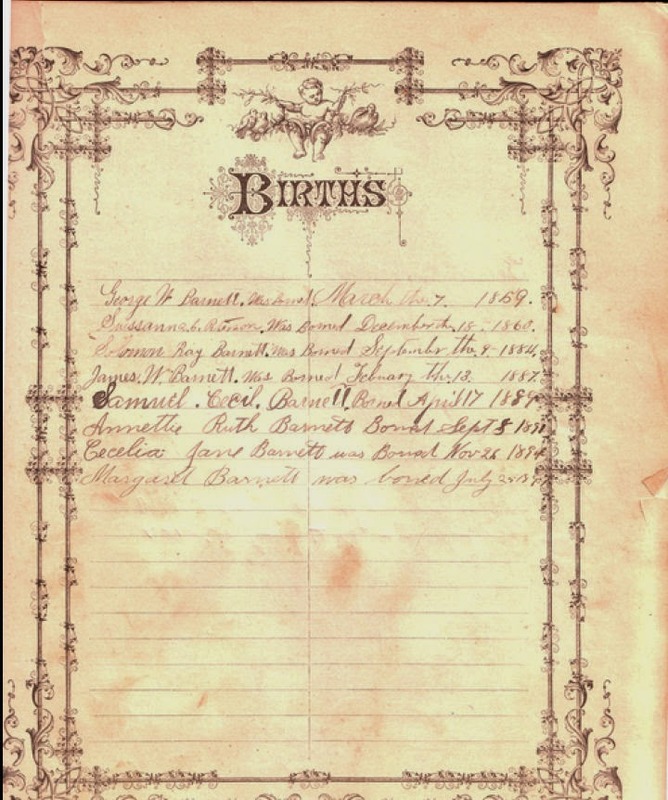 The Local & Family History Center of the St. Joseph County Public Library in South Bend will hold a Genealogy Roundtable on Thursday, May 1 at noon. Bring a bag lunch and ask questions, share your success stories and have fun. For more information, please call (574) 282-4621. The Indiana Genealogical Society now has 1,269 databases in the Members Only area. Each of Indiana's 92 counties has at least 5 databases. The Indiana Genealogical Society now has 1,268 databases in the Members Only area. Each of Indiana's 92 counties has at least 5 databases. The Indiana Genealogical Society now has 1,266 databases in the Members Only area. Each of Indiana's 92 counties has at least 5 databases. Would you like to help preserve court records from the 1800's? The Indiana Genealogical Society's Hendricks County probate records project is flattening and organizing probate packets from 1824-1900 in preparation for them to be digitized and placed online for free access. Stop by our next work session on Saturday, April 26, 2014 from 10 am to 4 pm at the Danville Public Library. We'll be flattening and organizing records from the 1870's through the 1890's. You can come when you want and stay for as little or as long as you like — lunch is on your own. To help us plan space, please register online or contact the library’s Indiana Room - phone (317) 718-8008 extension 140. If you can't make the April 26 session, we have another session scheduled for Saturday, July 5, 2014 from 10 am to 4 pm at the Plainfield Public Library. For more information about this project, please visit our Records Preservation Project page. Questions? Contact webmaster@indgensoc.org. The Lawrenceburg Public Library in Dearborn County will hold a meeting of their Genealogy Club on Saturday, May 3 at 2 pm in the library's Genealogy/Local History Room. Secrets of the census will be discussed, as well as successful research techniques and helpful genealogy websites. The meeting is free and open to the public - no registration is necessary. The Indiana Genealogical Society now has 1,265 databases in the Members Only area. Each of Indiana's 92 counties has at least 5 databases. The Southern Indiana Genealogical Society will meet on Thursday, May 1 at 7 pm in the Strassweg Auditorium of the New Albany-Floyd County Public Library (180 W. Spring St., New Albany IN). Guest speakers Melissa Wiseheart, Allison Fredrickson, and Kathy Fisher of the New Albany-Floyd County, Jeffersonville Township (Clark County), and Harrison County public libraries will discuss strategies for researching original settlers in Clark County, Floyd County and Harrison County by using a variety of resources. The Southern Indiana Genealogical Society will also be celebrating its 35th anniversary, and refreshments will be served. This meeting is free and open to the public. For more information, please visit http://www.rootsweb.ancestry.com/~insigs/nextmeet.htm. NOTE: This program is part of the Southern Indiana Genealogical Society's First Families of Floyd, Clark and Harrison Counties Project, which is dedicated to discovering, honoring, and preserving the memory of pioneers in the tri-county area. Membership in SIGS' First Families is open to anyone proving direct descent from a settler living in the tri-county area prior to December 31, 1840. The Indiana Genealogical Society now has 1,264 databases in the Members Only area. Each of Indiana's 92 counties has at least 5 databases. I am writing in hope of finding some additional paperwork involved in my dad's adoption. His mother, Ada "Addie" Rumbaugh, died two weeks after his birth. He was adopted by her sister, Grace, and husband Glenn Pillman on March 28th, 1918. Additionally, "adjudged and decreed by the court that said Walter Ernest Davis be and he is hereby adopted by said petitioners, Glenn and Grace Pillman ....and his name changed to Walter Ernest Pillman. "Cause No. 3296 Re: Adoption of Walter Ernest Davis appears upon the records on file in my office in Civil Order Book 12, page 525." Clerk LaPorte Superior Court, Chris J. Bielefeldt. What I hope to find is the consent document signed by the father and referenced as "INSERT" above. If there is any other paperwork involved, I am requesting that, as well. Mortality schedules were special schedules to the federal census that were taken in 1850, 1860, 1870 and 1880. The 1850 mortality schedule listed those who had died between 1 June 1849 and 31 May 1850. The Indiana Genealogical Society now has 1,263 databases in the Members Only area. Each of Indiana's 92 counties has at least 5 databases. The Indiana Genealogical Society now has 1,262 databases in the Members Only area. Each of Indiana's 92 counties has at least 5 databases. Registration is now open for the Indiana Historical Society's Midwestern Roots 2014 conference, to be held on Friday, August 1 and Saturday, August 2 at the Marriott East on the southeast side of Indianapolis. There will also be several pre-conference events held around Indianapolis on Thursday, July 31. The theme of the conference is "Exploring Frontiers: What Would Your Pioneers Have Tweeted? ", with a focus on new technologies and online sources. However, there will also be other sessions on traditional sources and methodology. July 1st is the deadline for early registration. This is a transcription of a diary written in 1864 by Robert B. Craig of Bartholomew County, who served in Company G of the 33rd Indiana Infantry during the Civil War. Some of the pages were also scanned and included alongside the transcription. This database is free to the public - no membership is necessary in order to view it. 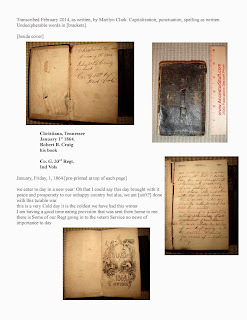 It was donated by Marilyn Clark, who was able to return the diary to descendants of Robert Craig's family. The Indiana Genealogical Society now has 1,261 databases in the Members Only area. Each of Indiana's 92 counties has at least 5 databases. Beginners and experienced researchers alike are welcome to come to a genealogy roundtable at the Mishawaka Public Library (209 Lincoln Way East, Mishawaka IN) on Thursday, April 24 at 6:30 pm. Guests will chat about their family history and research. For more information, please contact Deanna Juday (d.juday@mphpl.org). The Genealogy Club of Montgomery County has digitized several family Bibles. The digital images and transcriptions of the entries are online on the website of the Crawfordsville District Public Library's Local History/Genealogy Department. The Bible project was started in 2012 with a grant from the Indiana Genealogical Society. PICTURED: A digital image of the births listed in a Barnett family bible. The Indiana Genealogical Society now has 1,260 databases in the Members Only area. Each of Indiana's 92 counties has at least 5 databases. The Mishawaka Library (209 Lincoln Way E, Mishawaka IN) will offer a beginning genealogy class on Saturday, April 26 from 1 to 2 pm in the library's training lab. If you're interested in family research but don't know how or where to start, this class if for you. You'll learn how to begin researching your ancestors and what resources are available at the library to aid you in your research. For more information, visit www.mphpl.org or call (574) 259-5277 extension 215. The Indiana Genealogical Society now has 1,259 databases in the Members Only area. Each of Indiana's 92 counties has at least 5 databases. You can learn about some of South Bend's more sordid past by going on a free tour of South Bend City Cemetery (214 Elm St., South Bend IN) on Saturday, April 26 at 2:30 pm. Travis Childs from the Center for History will talk about the buried secrets in the area, including a history of grave-robbing. No registration is required for this tour - meet at the corner of West Colfax Street and Elm Street (no pets please). The tour will involve a fair amount of walking over uneven ground. The Indiana Genealogical Society now has 1,257 databases in the Members Only area. Each of Indiana's 92 counties has at least 5 databases. Twigs from the Tree of Life, a South Bend genealogy group, will meet on Tuesday, April 22 at 7 pm at Christ the King Lutheran Church (17195 Cleveland Rd., South Bend IN). The group will learn about efforts to document and preserve the historic South Bend City Cemetery and how you can contribute to this effort. Presenters will include: Elicia Feasel - Assistant Director, Historic Preservation Commission of South Bend & St. Joseph County; Oliver Davis - City of South Bend 6th District Council Member; Jonathon Geels - Project Specialist at City of South Bend; Deb Kuehn - GIS Manager at City of South Bend, and Steve Nemeth – Cemetery Sexton. This meeting is free and open to the public - for more information, contact Lynne Wolfgang (lynnewolf@aol.com). Looking for information on an ancestor who died in the Lafayette area? L.A. Clugh has compiled an online listing of the various funeral homes in Tippecanoe County, including the years they were in operation and which records are in the collection of the Tippecanoe County Historical Association's Alameda McCollough Research Library. This listing is a work in progress. The Allen County Genealogical Society of Indiana will meet on Wednesday, April 9 at 7 pm in Meeting Room A of the Allen County Public Library in Fort Wayne. Melissa Shimkus will present a program, "Discovering Our Female Ancestors." The meeting is free and the public is welcome; gathering time is 6:30 pm. The Genealogical Society of Marion County will meet on Saturday, April 12 from 1 to 3 pm at the Haughville branch of the Indianapolis Public Library. Dr. Margaret M. McMahon will present a program on how to search for ancestors using Google and its various tools. You will learn search techniques and how to construct searches to get the best results. The Elkhart County Genealogical Society will meet on Thursday, April 17 at 7 pm at the First Presbyterian Church (200 E. Beardsley, Elkhart IN - please use the east door of the church). Wanda Hoffman, the society's historian and library coordinator, will present a program, "Getting To Know Our County Seat," which was postponed from an earlier date. She will give the history of the county's courthouses from the beginning in 1830 through the present courthouse, which was built in 1905. Included will be interesting tidbits such as its tunnel under 3rd Street, its monuments, and its old fence. Information on Goshen’s cemeteries will also be discussed. Ms. Hoffman is a member of the local historical societies and is a volunteer at the Elkhart County Historical Museum and the Goshen Historical Society Museum. The Indiana Genealogical Society now has 1,254 databases in the Members Only area. Each of Indiana's 92 counties has at least 5 databases. I'm looking for a book/booklet printed in 1904 in Blackhawk, Indiana. The author is unknown. It is thought that the title possibly is: "Our Scotts in America". [I do not know the actual title]. It is a genealogy beginning with Simon SCOTT who was kidnapped from Scotland in the mid to late 1700's. Simon landed in the Carolinas where he was bound out to a family, working as a servant until he reached manhood. Simon lived from about 1742 to approximately 1784. He was married to Mary "Polly". Her last name was either WATKINS or HARN (possibly HORN or HARNE). I am hoping this book/booklet is in a public library but have been unsuccessful locating it thus far.